Gefilte Fish From Canned Tuna: Heresy Or ... Kinda Tasty? Gefilte fish ... made from canned tuna. It's time for gefilte fish. On this celebration of the Jewish exodus from Egypt, Jews in many lands dine on balls of fish. 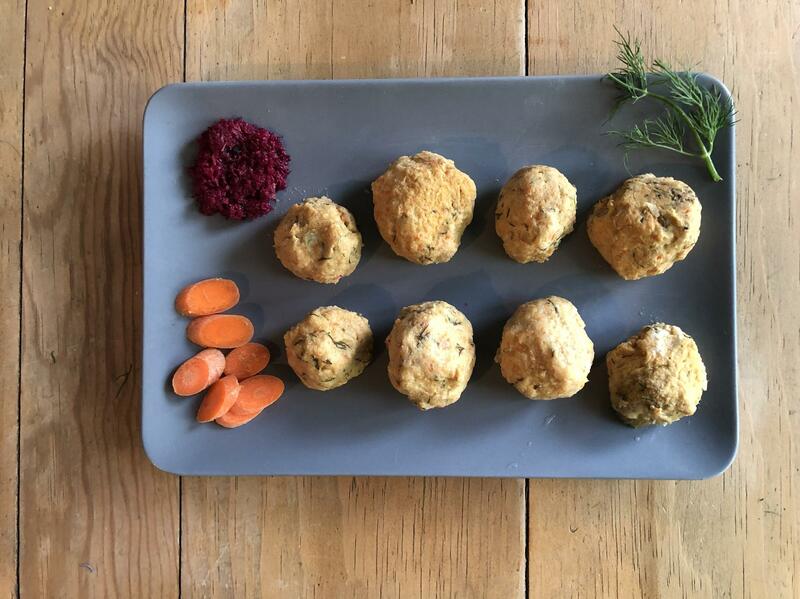 The orbs consist of ground fish and various fillers and enhancements: breadcrumbs or matzo meal, egg, chopped onion and carrots, sugar, salt, pepper, parsley or dill. Why fish? For one thing, they're a symbol of fertility. The dish is also served at traditional Sabbath dinners and other holidays. "Gefilte" means stuffed because back in the day (in Poland, for example, a couple hundred years ago), the home chef would stuff the cooked ground fish back into the skin of the fish for a lovely table presentation. But that was a lot of work! Eventually the fish dish morphed into hand-shaped balls, simmered in broth and then refrigerated until the broth forms a gelatinous bed. In the modern day, some folks make gefilte fish from scratch. Usually freshwater fish are used, like carp or pike, because it's tradition — that's what kind of fish would have been readily available in landlocked Eastern European nations. Ask the fishmonger to grind 'em up or do it yourself with a food processor. And then start balling. Or if you're not into ball-making, you can buy gefilte fish in a jar. And then, as many a home cook has done, simmer them in broth and add some special seasoning so you can declare, "Yes, I ... prepared ... the fish." You can also purchase gefilte fish from a Jewish-minded grocery store or gourmet shop. But there is more than one way to skin a fish. Last year, I was chatting with a colleague, Joe Palca, about what we did over the weekend. "I made gefilte fish," I said. "Oh, my grandmother used to make it with tuna fish," Joe said. My jaw dropped to my toes. Tuna fish? From a can? Yup. That's what she did. "I didn't care for them," Joe told me, although he couldn't remember exactly why. He was, he adds, a fan of non-tuna gefilte fish. I was kind of horrified but also fascinated — how did a cheap can of tuna take the place of fresh carp (which, way back in the day, were purchased in advance of the holiday and kept alive in home bathtubs before being dispatched of and ground up). I mean ... it's like making a cake out of Twinkies! I put out a Facebook query to see if any of my friends had heard of this practice. They responded with horror: "Never!" And "Good lord, no!" And from my daughter: "Please don't make that!" Since I'm a reporter, I began researching. I must admit failure in one sense. I did not find out who first had the idea that, hey, instead of buying fish and handling raw fish, why not open a can of tuna. Or maybe tuna companies marketed the recipe to increase their market. But it was definitely a thing as far back as the early 1960s, when Joe grew up. And I did find the tuna gefilte fish recipe in cookbooks that compiled recipes of members of synagogue sisterhood groups and also in newspaper articles from the 1960s and '70s. Jeffrey Yoskowitz, an authority on gefilte fish who has written the book The Gefilte Manifesto and runs an artisanal Jewish food business in New York called the Gefilteria, says, "I think it is hilarious and so funny and at the same time, I'm in no way surprised" that tuna swam its way into gefilte fish recipes. It's a reminder that Jewish food "adapts to local ways and local ingredients," he says. It speaks to an era in the not-too-distant American past when people were "really convinced that using processed food in their cooking will speed things up." "I am so curious to try this at some point," he says. 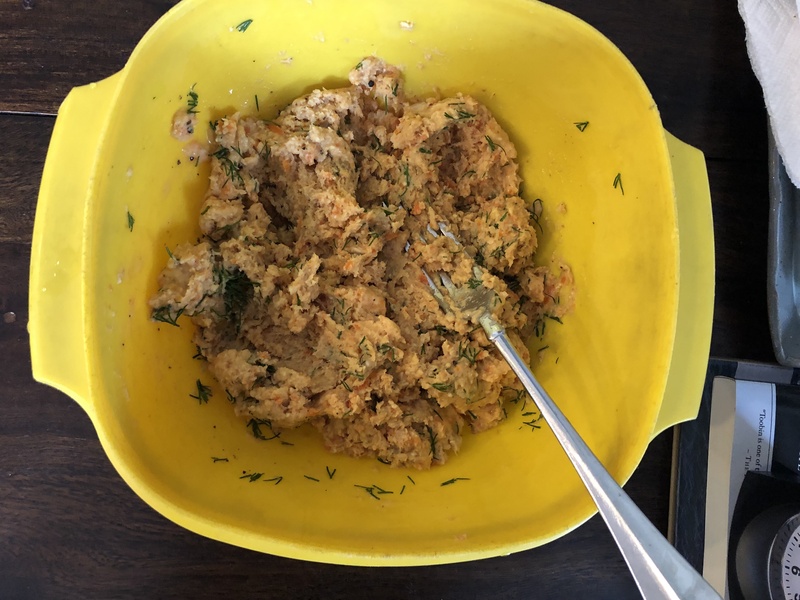 The tuna-based mixture for my '60s-era-inspired gefilte fish. There is a slight tuna-quality to the balls. Kind of a hint of tuna noodle casserole vibe. Which I liked! Two great comfort foods collide! But I wanted others to judge. So I served a platter up to my NPR colleagues, some of them gefilte fish fans and some of them not Jewish and not familiar with the concoction and curious about a lot of things, including why it's served cold or at room temperature. Perhaps because a) it had to be refrigerated anyway and b) it's an appetizer. Similar fish foods, like the Gallic gefilte cousin called quenelles, can also be served that way. The verdict of the tasters was mixed. "No, that is not gefilte fish," one taster opined. She said there was a bit of a gefilte fish vibe and a kind of tuna quality, but in the end, "it doesn't know what it wants to be." "The texture was really unappealing, really mushy and almost mealy," said my harshest critic. But some people were turned on by tuna. "I liked it!" declared a Jewish coworker. A taster of Egyptian/Filipino heritage had an interesting thought about the taste and texture: "It tastes like a mushy crab cake -– in a good way!" Yay! But the anti-shellfish rules of kashruth make me add: Oy! As for Joe Palca, he took one bite and immediately remembered his aversion to his grandmother's version: "Yeah, it's just as bad." If you're interested, here's what I did, adapted from a recipe in a Women's League for Conservative Judaism cookbook. Also, I'd like to share a tonier version of a tuna Passover dish developed by cookbook author Marcia Friedman, a convert to Judaism whose own background is Italian and who serves an Italian fish loaf at her Passover meal. She finds traditional gefilte fish too ... fishy and slimy. Put water in large stock pot. Add onion, carrots, celery. Bring to a boil, reduce heat so stock is at a low simmer. Meanwhile, open a can of tuna. Drain. After about 10 minutes, fish the carrot and onion chunks out of the stock with a strainer and put in food processor. Grate coarsely. Put mixture in bowl. Stir in lightly beaten egg, dill and seasonings. With wet hands, scoop up mixture and make balls each about the size of a large egg. Carefully lower balls into the simmering stock. The original recipe calls for cooking 30 minutes covered and then another 30 minutes uncovered. Really, 20 minutes for each seemed to be fine. Fish out balls with a slotted spoon, place on flat dish. Cool, cover and refrigerate a couple of hours or overnight. Yield: about 14 tuna gefilte fish balls. 2 short pieces of kitchen twine. Finely chop tuna by hand or with food processor. Thoroughly combine it in a bowl with mashed potato, artichoke hearts, pepper and eggs. Break up any remaining large chunks of fish. The mixture should be cohesive. Place cheesecloth on a plate or another surface. Spoon the mixture near one edge of the cloth and shape the tuna into a roll about 2 ½ inches in diameter and 9 inches long (make sure it fits into your cooking pan). Squeeze roll tightly to ensure the mixture is compact and evenly distributed. Roll cheesecloth tightly around it; twist ends and tie with kitchen string. Carefully place tuna roll on top of onions. Slowly pour white wine over top of roll (not directly into the hot oil). Slowly add water to just cover the roll. Bring to a gentle simmer and cook uncovered for 40 minutes, gently turning the roll a few times. Using two large spoons or spatulas to support the ends, transfer tuna roll to a dish. When cool enough to handle, gentle remove the cheesecloth. If the roll cracks or separates, firmly reshape it. Cover the dish tightly with foil and refrigerate overnight. To serve, let tuna roll set at room temperature for 10 to 15 minutes. For Friedman's recipe for an accompanying horseradish green sauce, click on the link below. Recipe created for and first published on the Jewish Food Experience with a recipe for green horseradish sauce as an accompaniment. 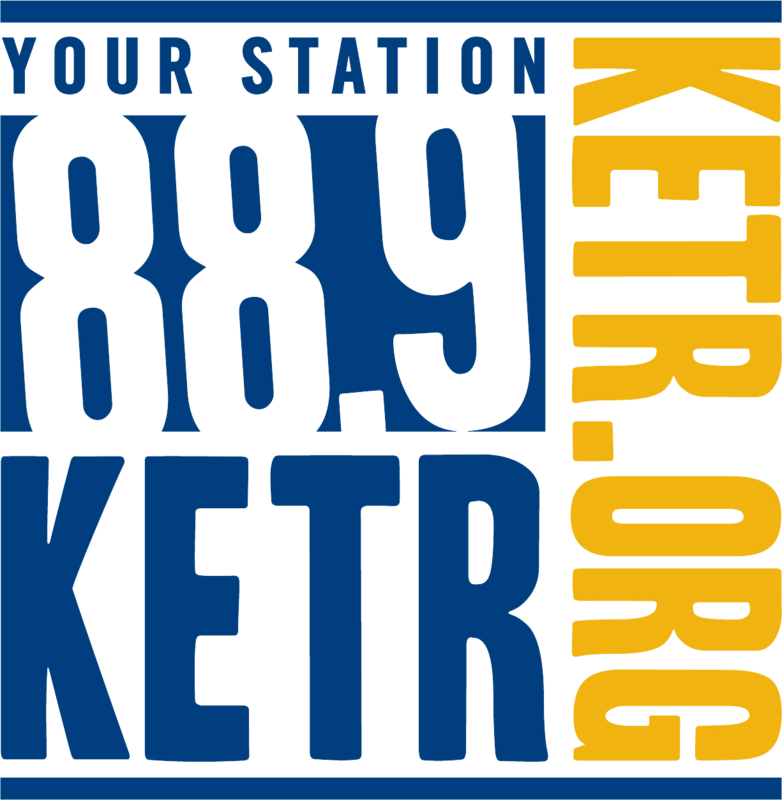 ------------------------------------------------------------------------------------------NPR Researcher Katie Daugert contributed to this report.